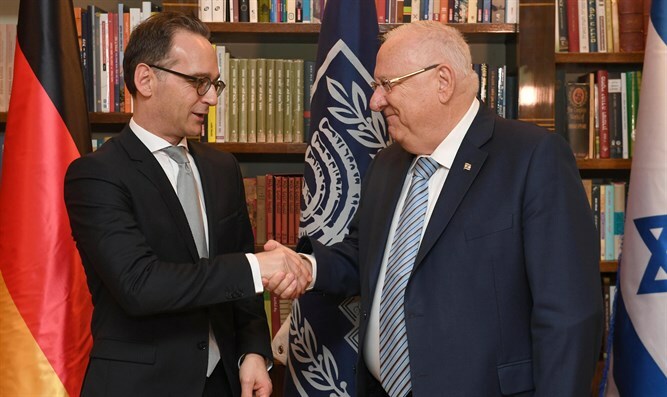 "We always appreciate and remember the deep commitment of the German government to Israel and the Jewish people,” Rivlin told his guest. Maas thanked the President for the warm welcome and added, "Our countries have very special ties and I want to clarify this at the beginning of my term. As Minister of Justice, I visited Israel many times and shared joint initiatives with my colleague Ayelet Shaked." The Minister continued, "I was very pleased to accept our embassy's invitation to take part in Israel's 70th anniversary celebrations. Germany has a genuine desire to take part in and assist in all the major issues that plague the world, and part of the reason for my visit is the desire to know what is bothering the citizens of Israel." Maas made it clear that Germany would not accept Iran's position calling for the destruction of the State of Israel and that Germany would not accept the existence of an Iranian nuclear program. The Minister stressed that the State of Israel's concerns are taken seriously and responsibly in the face of the existing threats.